Smart Functions : 3 in 1 colour temperature. A classic fitting that enter the lighting industry over a decade ago with fluorescent tube lights. Voltacon re-engineered the electronics and reshape the housing, making a brand new energy-efficient LED luminaire. The New-Cyrus is thinner, made of better materials, it is also thinner and more compact compared to his fluorescent predecessor. The CYRUS is a modern light fitting suitable for offices, corridors, shopping centers and light industrial applications. The fitting is pre-wired and ready to be used with the LED boards. You can customise this quality fitting by adding a number of functions. Voltacon assembles and tests all the versions of Cyrus ceiling light in the our laboratory in the UK. The main housing is metal sheet with electrostastic paint, the opaque diffuser evenly distributes the light for a more pleasant to eye feeling. At Ledison Lighting, we're looking for the best ways to provide uninterruptible light as well as continuous savings on your energy bills. 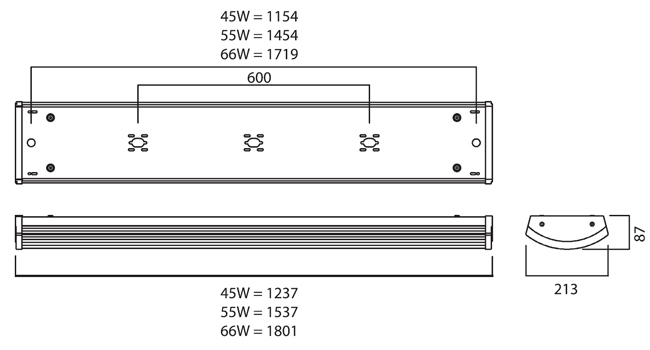 Every Cyrus LED luminaire is built with aluminium printed curcuit board , that are bonded directly on to the metal back-plate. The housing is acting a large heatsink that cools down the lighting emitting diodes. a. Standard operation , it works as a normal light. b. Emergency function with lithium battery and 3 hours autonomy. c. Microwave motion dection with daylight sensor.